The more you buy, the more you save! A thoughtful gift! Are you pregnant and suffering from morning sickness? There is now a convenient morning sickness bag which is a must-have for expectant moms. Morning sickness happens at any time of the day and it can be very stressful not knowing when or where you will have the urge to vomit. 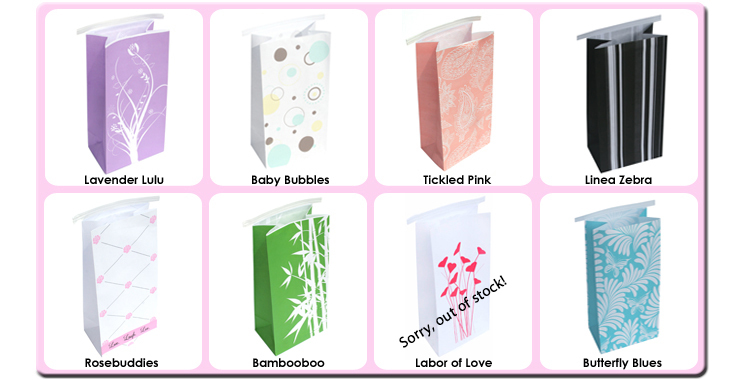 Morning Chicness Bags are compact, disposable, affordable, and yet stylish vomit bags. Now you can carry a chic morning sickness bag everywhere you go. You no longer have to use airsickness bags from the airplane, leaky plastic shopping bags or bulky garbage bags. You can stop searching for the nearest toilet bowl everywhere you go, and no more sticking your head in a disgusting, smelly garbage can! Morning Chicness Bags are excellent gifts for your pregnant friend or wife. Help her make this difficult time a little easier for her. She will love this thoughtful, practical and unique gift! These bags can also be used by people suffering from motion sickness or from taking a medication. It's a great idea to keep them in your glove compartment or purse. Bags come in a variety of beautiful, trendy designs. Choose from 8 patterns. Bags are made of sturdy paper with leak-proof polyethylene lining and horizontal closure clip. Bags measure 5"x3"x9.5" and are biodegradable.